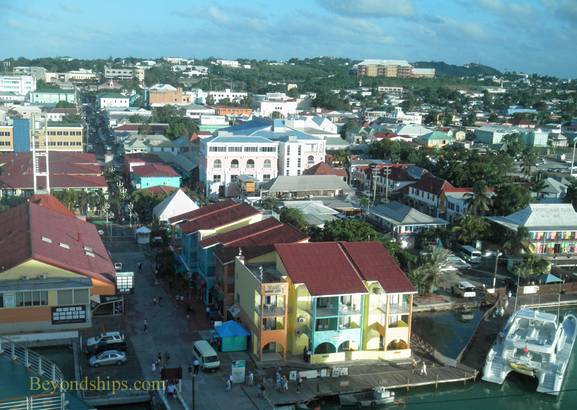 St. John's is the capital and largest city in Antigua and Barbuda. 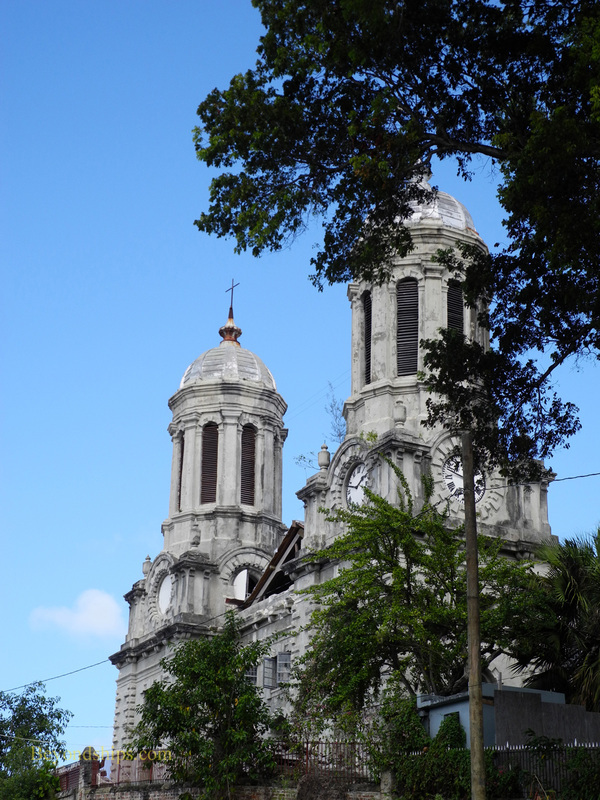 It has been the administrative center of the islands since they were settled in the 17th century. The city is about four square miles and is laid out in a grid system. When crossing the streets beware of the deep furrows that often lie between the sidewalks and the street. Traffic, especially near the cruise port, can also be quite busy. 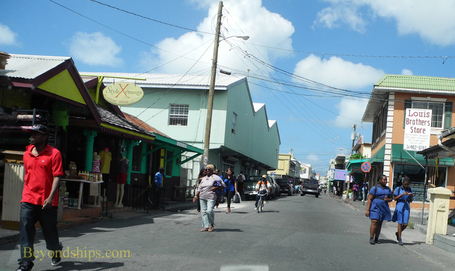 The character of St. John's changes almost immediately upon leaving the cruise port area. The cruise port is focuses on visitors while the remainder of St. John's is geared toward the island's residents. Nonetheless, there are places of interest to visitors beyond the cruise port. The Baroque towers of the Anglican Cathedral dominate St. John's skyline. Built in 1845, this is the third church to stand on the site. (The prior two were destroyed by earthquakes). As of this writing, the Cathedral is undergoing restoration work. 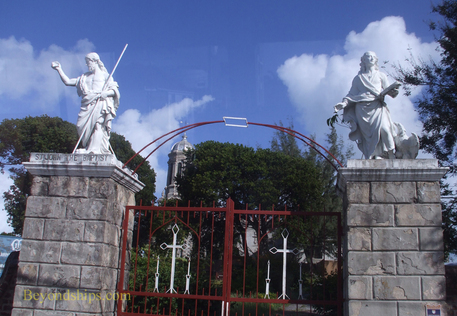 Below: The statues on the cathedral gate are said to have been captured from the French by HMS Temple during the Seven Years War. 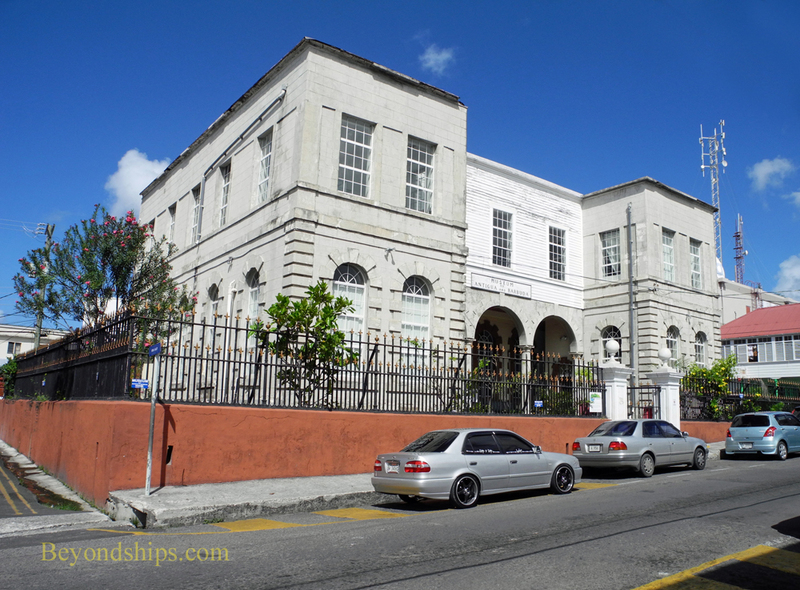 Housed in a former courthouse built circa 1750, the Museum is the oldest building still in use in St. John's. It tells the story of these islands from pre-historic times to the present day. Exhibits include Arawak and colonial era artifacts, a life size reproduction of an Arawak House and the bat of Antigua cricket star Viv Richards. Located on a headland at the entrance to the harbor are the ruins of Fort James. Built by the British in 1706 to protect St. John's harbor, the abandoned fortress is unusual in that it still has a full complement of cannons. 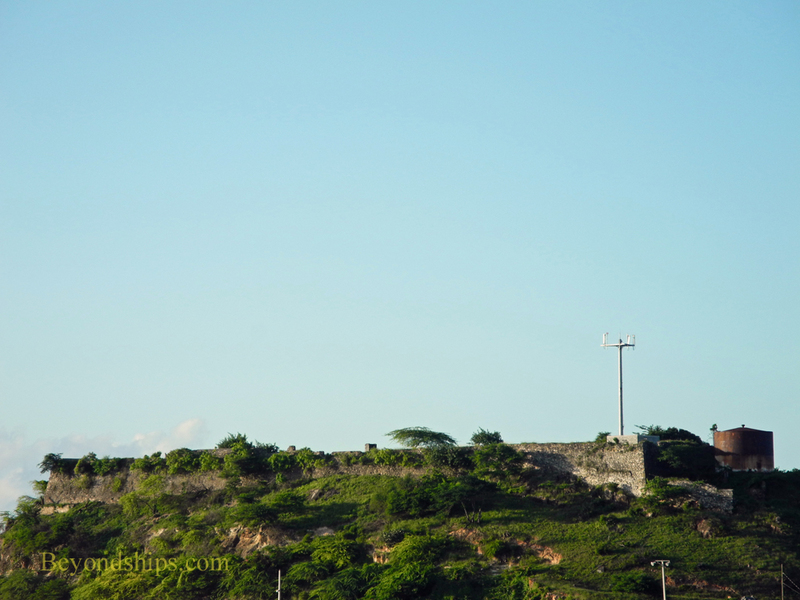 As it is on a high promontory, the site offers scenic views of St. John's. 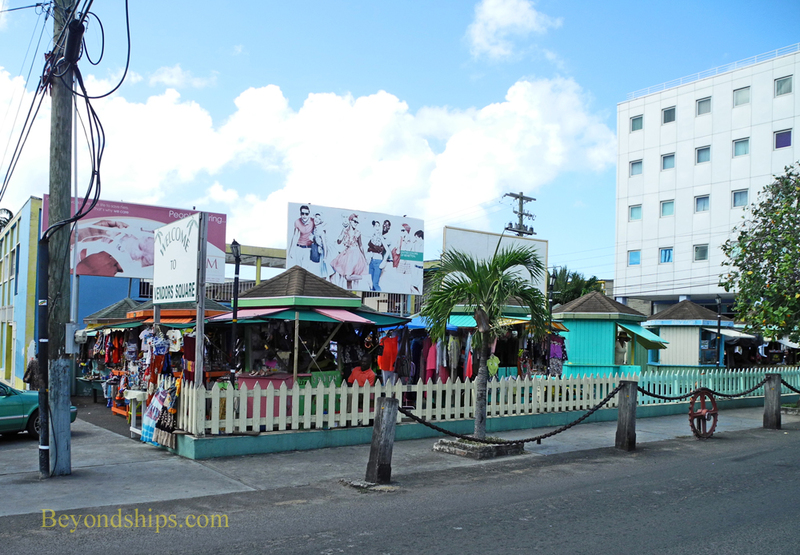 Not far from the cruise port is Vendor's Square where locals sell local crafts and souvenirs (left). 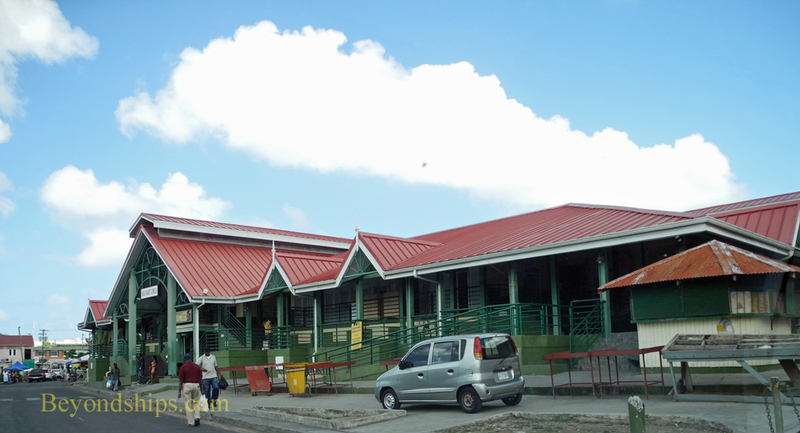 Further away from the cruise port near the bus station is the Public Market Complex or Heritage Market (below). Here, vendors sell local fruits and vegetables including mangoes, breadfruit, sugar apples and pineapples.